I finally watched "Diana Vreeland: The Eye Has to Travel," a documentary about the life and ideas of the greatest fashion editor and stylist of the 20th century. The word "visionary" is thrown around a lot, but you cannot walk away from watching this film without knowing that this woman lived, breathed and thought about the world through style and beauty. Just as there are people thinking about the world linguistically, architecturally, musically, or through scents, there are people like Vreeland who find truth in the things we put on our bodies or in our homes. These seemingly frivolous appurtenances like clothes and accessories can become part of the visual language we use to speak ourselves everyday. It certainly was the way she moved through the world, saw the world, and spoke the world. She believed that clothes could even portend cultural shifts, and said once in an interview: "You can see the approach of revolution in clothes." One of the best introductions to the profound whimsy of Vreeland's vision is the first installment of her fashion "advice" column, "Why Don't You..." in Harper's Bazaar *(1936). "Why Don't You..." is less about giving real fashion advice (unless you're Lady Gaga) and more about introducing the reader to a radical new way of thinking about what style — as opposed to fashion — is. She invites the reader to see style in the unusual, the surreal, the decadent, and the absurd, and the column almost reads like a child's game, or a series of dares. Zip yourself into your evening dresses? Waft a big bouquet around like a fairy wand? Stick Japanese hair-pins in your hair? Buy a transparent evening coat? Or a geranium chiffon toque? Expose your fortune in an isinglass bag? Hide your hips under an accordion-pleated jacket? One of my favorite of her "Why Don't You..." tips is read by her granddaughter in the documentary: "Why don't you wear violet velvet mittens with everything?" Why not indeed! Beauty, as seen by a woman who was herself no conventional beauty, was what was unusual about a person's features. She would instruct photographers to exaggerate what at the time would have been considered a model's flaws. In eras in which tidy, WASPy, so-called "perfect" looks were ideal, she celebrated Barbra Streisand's "Nerfertiti" nose, Penelope Tree's doe-eyed, doleful face, the gap between Lauren Hutton's teeth, and Mick Jagger's plump lips. And of course she loved perfume. I still can't seem to figure out which perfume she loved, but here are some anecdotes I was able to round up. She had perfume injected into her pillows with hypodermic needles. Harold Koda, curator of the Costume Institute at the Metropolitan Museum of Art, says in the documentary that after she was fired by Vogue (?! ), she was hired as the first-ever curator of the Met's Costume Institute, and had fragrance "pumped through the air-conditioning vents" of the exhibits. The blog Perfume Chronicles includes this fantastic quote from her George Plimpton-aided memoir, D.V. : "There’s a whole school now that says that the scent must be faint. This is ridiculous. I’m speaking from the experience of a lifetime. I always carry purse scent – that way I’m never without it. Do you notice any scent on me now? Don’t come any closer – if you have to sniff like a hound, it’s not enough!" And although she declares that "Perfume is an extravagance," extravagance, in her world, is the precondition for the good life, a necessity and not an occasional add-on. And extravagance is not dependent on money. Luxury, decadence, and extravagence for Vreeland are fueled by imagination. (Of course, money helps!) "I believe in the dream," she says in D.V. "I think we only live in our dreams and our imagination. That's the only reality we ever really know." I was truly moved by this documentary, and look forward to getting my mitts on D.V. and the recently released Diana Vreeland Memos: The Vogue Years, compiled by her grandson Alexander Vreeland. How can you not fall in love with a woman who, when asked by reporter Jane Pauley who the most stylish person in the world is, replies, "A racehorse," and whose ordinary thoughts include concerns like: "This world without a leopard. Who'd want to be there?" That leopard, I'm convinced, stands in for everything that is wild and beautiful. And I, for one, don't want to live in a world without them either. Years ago, I was a professional blogger. One of my pals in the office, Annie Tomlin, was the editor of the blogging network's beauty site, BellaSugar. Her post: Gettin' Snoopy: How Your Things Reveal Your Personality, is totally fascinating. I think Gosling's description of my personality via that shelf is dead on — as is his description of people I knew but he'd never met or seen — simply based on his analysis of the way they organized their toiletries! Most of the pictures he analyzed were of readers' medicine cabinets, but a few of the pics came from people we worked with. "In contrast to 3 and 4 for whom clutter was unsettling, this person is at ease with complexity and uncertainty; whereas 3 and 4 are reassured by clarity and order, person 5 is more attuned to depth, complexity, and mystery that the various perfumes and their arrangement connote. Specifically, the bottles are roughly corralled onto the shelf but not rigidly lined up. It’s a more fluid, creative, aesthetically driven arrangement." Yessss! I do like the depth, complexity and mystery of perfumes, thank you very much. It's hard to see the details in the picture, but scattered among the perfumes, I added opium pipes, a single empty vintage Shalimar bottle, Moroccan eyeliner, and a Victorian cosmetic compact. To me, perfumes represent faraway lands, romantic addictions, glamour, and the mysteries of the past. I keep moving around, and so my perfume stash-turned-hoard is in various boxes and suitcases, so I can't show you what it looks now. What does you perfume shelf look like? Send links to your blog and/or Flickr accounts (or Instagram or wherever you post images), and I'll add the links to this post as they come! I don't have Sam on hand to analyze them, but it will be fun to see everyone's perfume collections. Jennifer Lawrence's Character in American Hustle Loves Stinky Perfume! Flowers with garbage, you say? 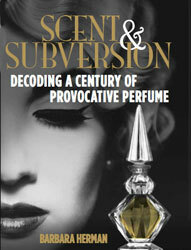 "Historically, perfumes are laced with something nasty? "* (*Every perfume book recently written!) Hmmm. It all sounds very familiar!